Joan decides to blackmail Barbara after discovering her secret papers, and the police arrive at the halfway house to question Tony. The police ask to search Joan's locker, and Colleen has to ask them to hold off until Joan can be present. When they ask Joan about the gloves, she tells them they went missing earlier the same day. She protests her innocence, but cannot give a proper alibi, as went home alone and stayed there all night. Neil blunders into the staff room during the interview. Joan agrees to come to the police station later to make a statement. Bea amazes Chrissie by offering to get her a packet of cigarettes outside the buyup at normal price: Chrissie promptly orders a whole carton. Helen visits the halfway house to see Judy: Tony thinks she's wanting a room. Beryl arrives with birdcage in hand, amd Tony notices after she's gone to her room that her canary seems to changed colour. Joan catches Barbara reading her papers in her cell and confiscates them : she demands that Barbara spies on Bea and Steve to find out what they are planning. Meg visits the halfway house and notices a very loud chorus of birds chirruping: Beryl's room is searched and found to be full of bird-cages. 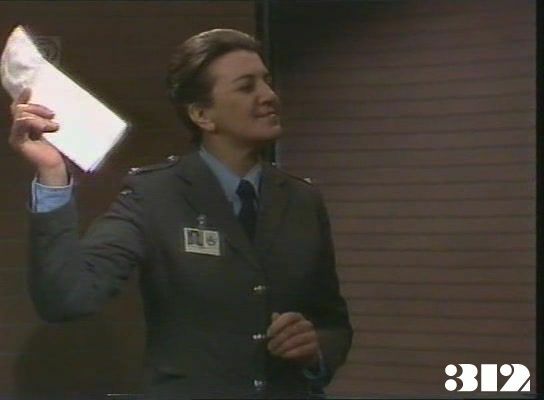 Joan makes a statement and tells Insp Thorne she is being set up, as the clue left was so obvious. He reminds her that she has no proper alibi and that if the gloves were stolen there would have been very little opportunity to have them smuggled out. Barbara passes on to Bea what she's heard about Joan being interviewed by the police. In return, Bea lets Barbara know she's arranging a special delivery and can order whatever she likes. Helen is attacked in the hallway of her flat: her attacker runs away before she can see who it is. Insp Thorne tells Joan he is sure Helen's attacker was a man - and anyway Joan was being followed so the police know exactly where she was at the time of the attack - but isn't convinced the incident is connected to the murders, so she is still under suspicion. Chrissie is on sick call yet again when Colleen brings Inspector Thorne to interview Neil: he produces a cinema ticket as an alibi. Colleen leaves Chrissie outside the infirmary, so she is able to overhear about the attack on Helen and the identity of the second victim. Chrissie passes on the information to Bea and Bea hands over her cigarettes. Joan catches Chrissie with some of the contraband cigarettes, and later comes across a deliberately staged meeting between Bea and Steve, where she hands over some money to him. Steve takes the money to Erica, who reiterates that she doesn't think the plot against Joan is very ethical. Bea tells the women to create a disturbance in the dining room while Steve is the only officer on duty. Maxine goes to visit her mother at the service station. Colleen breaks up the arranged food fight in the dining room, and Erica cancels buyup. Margo is puzzled at Bea's lack of concern at losing buyup. Maxine's father tells her he only paid her bail so she could attend her sister's wedding: Maxine leaves in disgust, saying she'll pay back the money when she can. Bea promises to get goods in if the women will place their orders. Erica suggests a placement for Beryl as housekeeper with some friends of hers in the country. Dr Weissman hypnotises Paddy to help her remember what happened at the party. Maxine returns to the halfway house. Paddy tells Bea she couldn't remember what she said under hynosis until Dr. Weissman played back the tape. Insp Thorne finds out that Tony visited both Penny and Tina and goes to interview him. He arrives at the halfway house just as Maxine and Tony are having a snog, but when he interviews Tony he seems confused and evasive.